(Nanowerk News) As firefighters emerge from another record wildfire season in the Western United States, University of California, Berkeley, scientists say it's time to give them a 21st century tool: a fire-spotting satellite. Such a satellite could view the Western states almost continuously, snapping pictures of the ground every few seconds in search of hot spots that could be newly ignited wildfires. Firefighting resources could then be directed to these spots in hopes of preventing the fires from growing out of control and threatening lives and property. 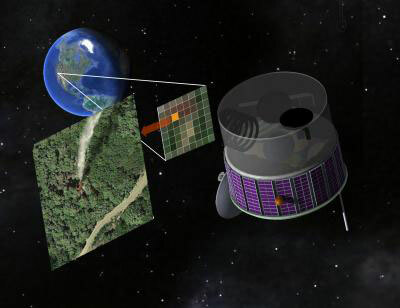 The UC Berkeley scientists have designed such a satellite using state-of-the-art sensors, written analysis software to minimize false alarms, and even given it a name – the Fire Urgency Estimator in Geosynchronous Orbit (FUEGO). They're hopeful it can be built for several hundred million dollars, either by government or private entities. "If we had information on the location of fires when they were smaller, then we could take appropriate actions quicker and more easily, including preparing for evacuation," said fire expert Scott Stephens, a UC Berkeley associate professor of environmental science, policy and management. "Wildfires would be smaller in scale if you could detect them before they got too big, like less than an acre." Stephens, physicist Carl Pennypacker, remote sensing expert Maggi Kelly and their colleagues describe the satellite in an article published online Oct. 17 by the journal Remote Sensing ("FUEGO — Fire Urgency Estimator in Geosynchronous Orbit — A Proposed Early-Warning Fire Detection System"). "With a satellite like this, we will have a good chance of seeing something from orbit before it becomes an Oakland fire," said Pennypacker, a research associate at UC Berkeley's Space Sciences Laboratory and scientist at Lawrence Berkeley National Laboratory, referring to the devastating 1991 fire that destroyed more than 3,000 homes in Berkeley and Oakland. "It could pay for itself in one firefighting season." With global warming, Stephens said, wildfires are expected to become more frequent and more extensive. This year alone, California's firefighting arm, CAL FIRE, has responded to over 6,000 wildfires, 1,600 more than average, according to tweets by the department's information officer Daniel Berlant. Wildfire-prone areas stretching from Spain to Russia could also benefit from their own dedicated satellites. Fire detection today is much like it was 200 years ago, Stephens said, relying primarily on spotters in fire towers or on the ground and on reports from members of the public. This information is augmented by aerial reconnaissance and lightning detectors that steer firefighters to ground strikes, which are one of the most common wildfire sparks. "Even today, most fires are detected, in some way or another, by people," he said. "Even the Rim Fire near Yosemite National Park this past summer was detected by someone who saw a smoke column." But satellite technology, remote sensing and computing have advanced to the stage where it's now possible to orbit a geostationary satellite that can reliably distinguish small, but spreading, wildfires with few false alarms. Pennypacker estimates that the satellite, which could be built and operated by the federal government, like the Geostationary Operational Environmental Satellite (GOES); as a partnership between government and the private sector, like the Landsat satellite program; or by a private company alone, would cost several hundred million dollars – a fraction of the nation's $2.5 billion yearly firefighting budget. The idea of a fire detection satellite has been floated before, but until recently, detectors have been prohibitively expensive, and the difficulty of discriminating a small burning area from other bright hotspots, such as sunlight glinting off a mirror or windshield, made the likelihood of false alarms high. Today, computers are faster, detectors cheaper and more sensitive, and analysis software far more advanced, making false alarms much less likely, according to researchers. "Simply put, we believe we have shown that this kind of rapid, sensitive fire detection of areas bigger than 10 feet on a side is probably feasible from space, and we have evidence that the false alarm rate will not be crazy," said Pennypacker, who has designed sensitive satellite-borne detectors for 40 years. "Our work requires further testing, which we are eager to do." The approach is similar to what Pennypacker and colleague Saul Perlmutter used 20 years ago to search for exploding stars to study the expansion of the universe. In that case, they created an automated system to compare consecutive images of the night sky to look for new points of light that could be supernovas. Perlmutter, UC Berkeley professor of physics, shared the 2010 Nobel Prize in Physics for this work, which proved that the expansion of the universe is accelerating. "In concept, this is a simple system: a telephoto camera, an infrared filter and a recording device. We are just looking for something bright compared to the surroundings or changing over time," Kelly said. "Then, we do these rapid calculations to determine if one image is different from the next." Pennypacker and graduate student Marek K. Jakubowski developed a computer analysis technique, or algorithm, to detect these differences in space and time and to distinguish them from bright lights that might look like fires. This involves several billion calculations per second on images taken every few seconds, covering the entire West every few minutes. The new paper reports on tests of this algorithm using existing imagery from real fires, but the team hopes to get funding to test the system on a fire that is starting, such as a prescribed burn. "The point is, satellites like Landsat and GOES provide great information after a fire starts; they can focus and monitor a fire by looking at smoke plumes, fire spread, hot spots at the edges, etc.," Kelly said. "FUEGO is designed for early detection of smaller fires. Right now, we lose a lot of time because fires are already big by the time we see them."